Then I got a Facebook message from a friend saying a photo of mine made it into the Cape Times this morning. At the same time an email popped in asking when I would like to do the shoot. Then another email with the pdf file with the article/photo. And then I checked www.overtone.co.za and there’s the banner that my friends at www.taluut.nl made for my project. Invitations should be ready soon as well. Wow. It almost seems real:-) I am going to have an exhibition. A solo exhibition. A solo exhibition in Cape Town. Cape Town as in South Africa as in not my home country. Nice. I am almost inclined to say that it is a happy Monday. If I was an optimist or even a realist that would be true. 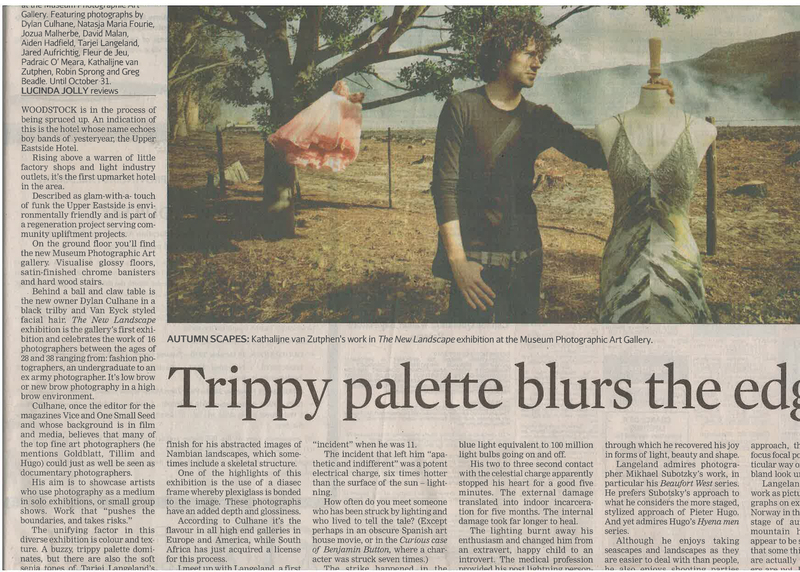 The photo in the Cape Times is a photo that is currently on show at the Museum Gallery. It was taken for the Swimming Upstream project but didn’t make the selection. It’s a portrait of fashion designer Hendrik Vermeulen and we shot it in Tokai a while back. I will post more on that later. And yes, of course, the title is from the Happy Monday’s third album. This entry was posted in exhibition, music, photography, Swimming Upstream and tagged article, cape times, exhibition, fashion designer, gallery, happy mondays, hendrik vermeulen, music, photography, the sonics. Bookmark the permalink.